7 game schedule, no playoffs. Scores will be recorded and published. There will be point deductions for running up the score, see front desk for the full "FIVE GOAL RULE"
There may only be one division in this age group, if it is possible to divide into 2 divisions we will do so. 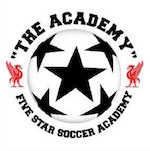 Check out this Soccer (Indoor) league '#07 - 14U Girls Session 3' with Five Star Soccer Academy!